The JHU campus is teeming with Pokémon GO players. 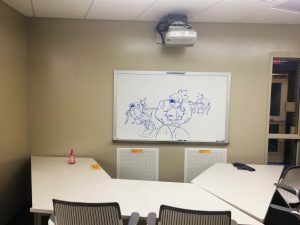 Recently, the Milton S. Eisenhower Library (MSEL) staff stumbled upon two students, Rohith Bhethanabotla and Conan Chen, who were freehand drawing Pokémon characters in one of the Brody Learning Commons (BLC) study rooms. I sat down with these two to find out what inspired them to fill the whiteboards with Pokémon characters. 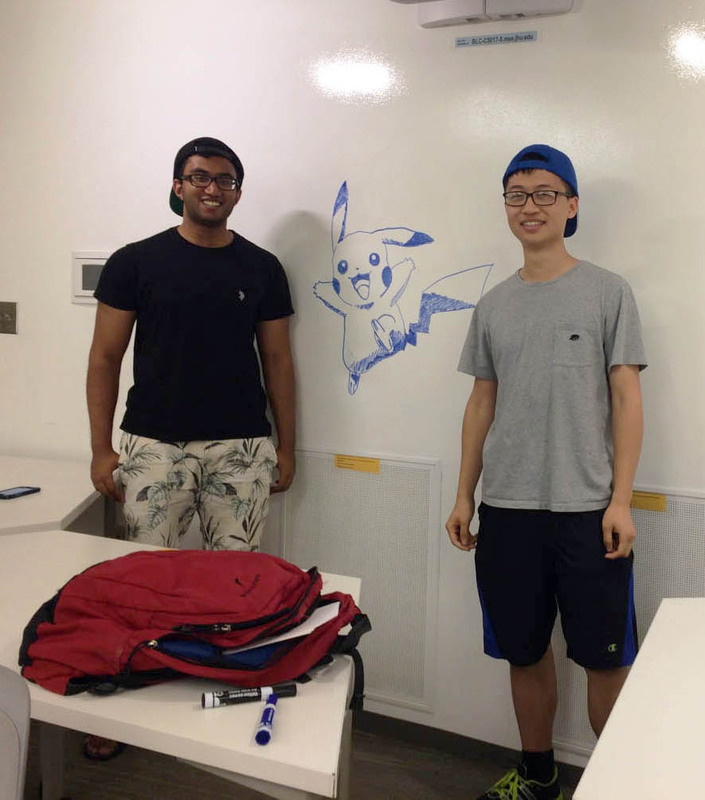 Rohith and Conan are both Biomedical Engineering juniors from San Jose, CA and North Brunswick, NJ respectively. For the sake of this interview, and with their permission, I asked it if was okay if I called them “RoCo.” They seemed to like the nickname and gave the go ahead. So, how did you guys get started on this? 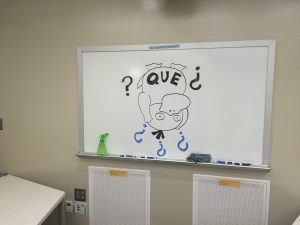 How did you draw the figures? Traced, freehand? Says Rohith, “Well, I’d say Conan is better at drawing confident smooth edges. I like to sketch so my edges were jagged at first, but what we found more challenging was drawing the shadows on the figures.” RoCo drew the various Pokémon on the six whiteboards in study rooms BLC 5015/5017. It took them roughly an hour and a half to finish all the drawings. 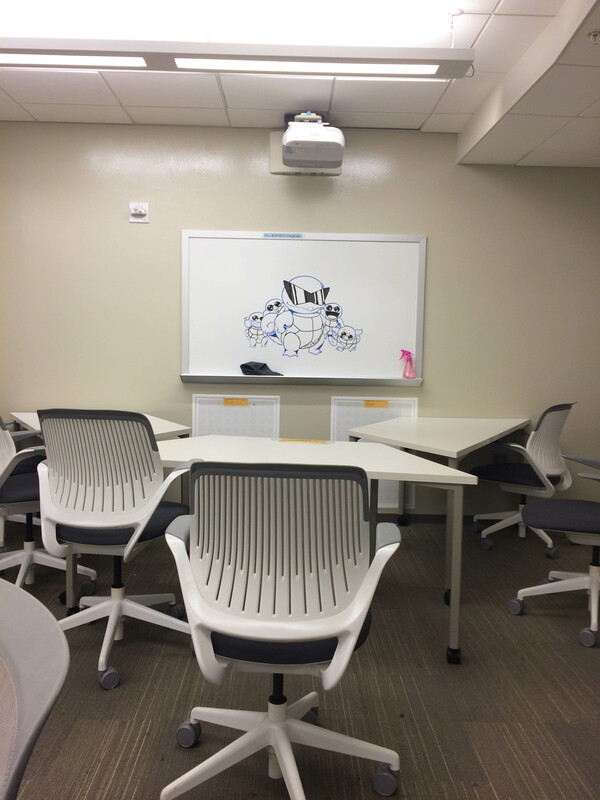 “We got better as we went along.” They then began to describe each drawing. (Shown here beginning at top). “The Pikachu took a while; that’s the one where we’re both in the picture. 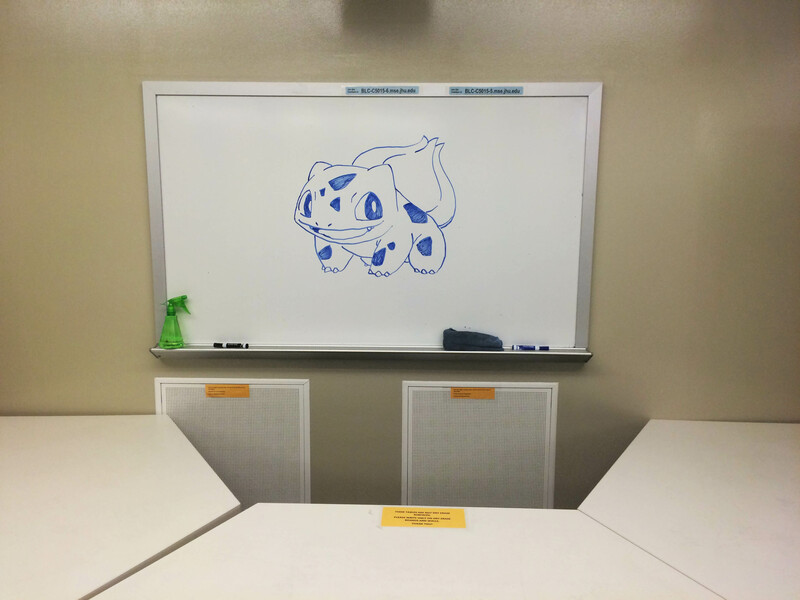 The second through fourth images (Charmander, Bulbasaur, Squirtle) are first generation starters and were easy to draw as well. The fifth one was challenging, because we basically “muscularized” Magikarp. 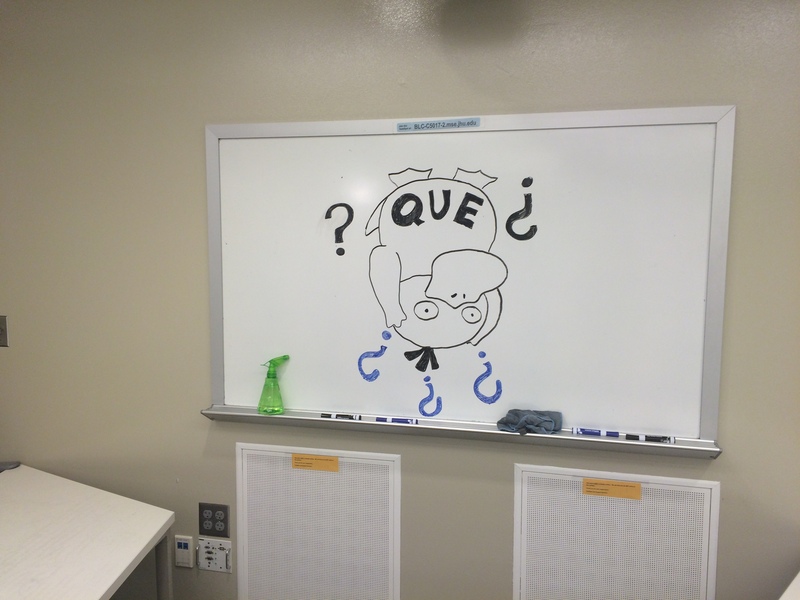 The last one, Psyduck, is always confused, so we drew it upside down and,” says Conan, “because Rohith speaks Spanish we added the ‘Que’ along with question marks.” Laughed Rohith, “Well…I don’t actually speak Spanish.” Nevertheless, this was an artistic inspiration they added to Psyduck. So, why did you do this? How did this come about? 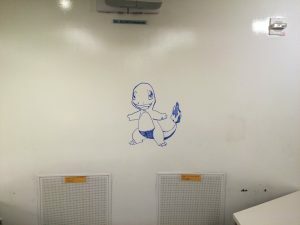 “At Hopkins, we rarely get the opportunity to just draw, so this was a fun way to de-stress.” I asked RoCo how long they think Pokémon GO will be the hottest game. Their response was unanimous. “Pokémon is unique in that it has a lot of characters (at least 6-7 generations), so the current Pokémon GO game is the first of 150 of them, and because everyone has this perfectionist mentality, people will keep playing to catch ‘em all. If Niantic, Inc. keeps releasing generations, the popularity will keep going. There are legendary Pokémon that haven’t been released to the public yet, so it seems what they’re trying to do is get a lot of hype for it and then release them. It was fun chatting with RoCo, and I think it’d be cool to see The Pokémon Company create a character named specifically after them: RoCo. I wonder what that would look like. Think you could draw a RoCo character? If so, share your sketches and drawings on our Instagram and Twitter (#RoCo), and Snapchat.